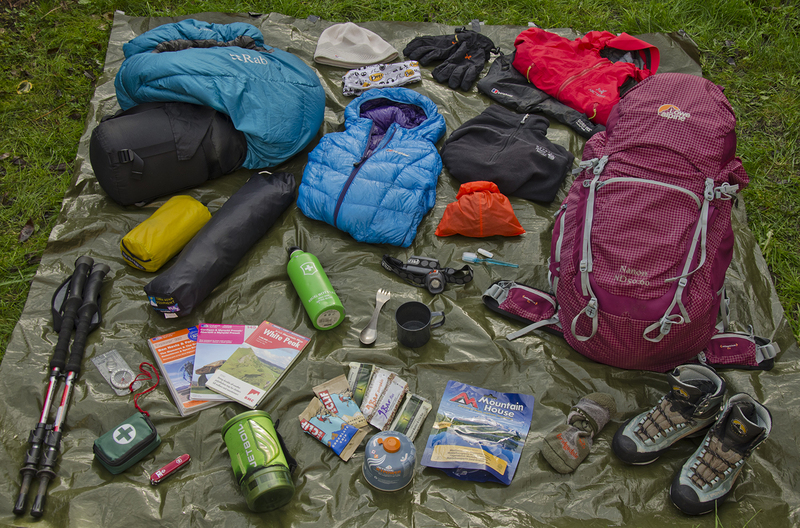 Kit List: What’s in my Go Bag? I’ll never forget the first time I was packing for a solo wild camp. My living room floor was covered in every single bit of outdoor gear I owned. Every item seemed impossibly bulky to fit inside my far-too-small rucksack and I was tearing my hair out wondering how on earth I was going to carry all of it on my back. Ten years on and, even though my kit has got lighter and smaller, after a busy day at work if the mood suddenly takes me to head out on an impromptu wild camp it can still take me a long time to locate all my bits of gear around the house and get packed - so long in fact that afterwards I’d be so tired of the process that I’d likely consider calling off the camp altogether. And so for several years now I’ve found the secret to ensuring I never miss an opportunity – my Go Bag. At all times I ensure I have it packed, ready with all the kit inside I’ll need for a wild camp. I then keep it in the boot of my car or by the front door, so when I get the chance the adventure can start straight away. Perhaps the most common questions I get asked are about my kit, so, to try and answer some of those I present to you my Go Bag kit list, along with the items I use the most. I regularly test the most recent and innovative gear but have my old favourites, which have withstood years of abuse (NOTE: none of the gear brands listed here have paid/asked me to be featured, these are all genuine recommendations). You always need to take something to sleep in – even if you’re planning on staying in a bothy (it might be full). I could argue back and forth between whether bivvy or tent is best – but we’ll save that debate for another time. However, the general rule for me is that on nights when I know the weather will be good and I’m planning a summit sleep and want to watch the stars I’ll take a bivvy. My favourite is my Terra Nova Hooped Jupiter Bivi – the hoop because if there’s midges about I can zip up a flysheet without feeling like I’m in a body bag – or my Alpkit Hunka (great for bargain hunters) for when biting insects aren’t an issue. 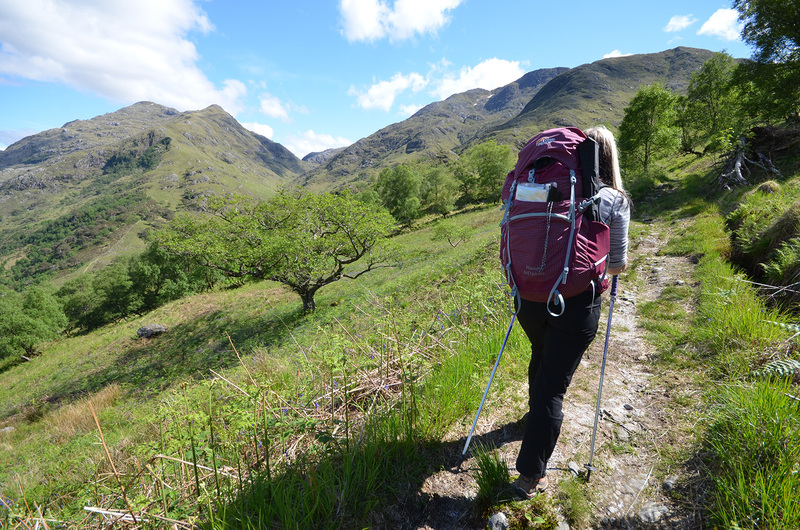 For me weight is key – I simply can’t carry too much on my back if I want to go far into the wilds. So when it comes to tents it has to be the Terra Nova Voyager Superlite. It’s so light that even though I have a one-man version I usually take the two-person so I can spread out. Bliss! Don’t be fooled. Though you can pick up a cheap foam one in the PoundShop, it’s a rookie mistake to think you can skimp here if you value your comfort. They come in all kinds and sizes – from foam to self-inflate – but my fave is the Therm-a-Rest NeoAir. You have to blow it up yourself, but it packs down smaller than a can of coke, weighs hardly anything and features a heat reflecting layer inside so that you get warm just by sleeping on it. I want to sleep well so that I can enjoy my days in the hills so this is another area I never cut corners in. I’ve tried loads and have several favourites. For general use year round I opt for my Marmot Angel Fire. It’s women-specific fit, which I find key – women’s sleeping bags are wider around the hips, narrower around the shoulders and usually have extra filling at the feet – worth knowing. For winter adventures it has to be my Rab Andes 800. I’ve used it at the freezing temperatures of Svalbard (last stop before the North Pole), at Everest Base Camp (where I slept two nights) and in Scottish bothies in the snow. With weight being important you’d think this would be an area I’d go minimal – but not me. I opt for the Jetboil Flash. As you can see mine’s taken its fair share of battering (a photographer once kicked it over setting fire to the sleeve!) but I adore it. As I only ever use it to boil water rather than cook a meal inside it’s ideal. The bottom comes off to be used as a cup/bowl; it has an igniter built-in and the stand and gas all fit inside it. Plus the flash turns yellow on the indicator to give you an idea when it’s boiling. Foolproof! Sometimes I’ll take a separate camping mug (mine’s a cheapo one from the Poundshop), but I’ll always take a Spork with me. It’s a spoon, knife, fork combi. There are loads of imitations but the Light My Fire Titanium one I find best. I’ve honed this to as small as possible over the years. Mine is about the size of a small wallet and has inside some plasters, Compeed (for blisters), sterile wipes for cuts/bites, tick removers, ibuprofen, Imodium, zinc oxide tape (again for blisters on multi-day trips) and duct tape – seriously fixes anything. Vital bit of kit for keeping your hands free while cooking, packing, looking for stuff inside your rucksack. Petzl I find to be the best – especially my Myo, but I usually also have e+Lite as an emergency back up too. I keep everything I will only need for sleeping in a small, easy to find, dry bag. It usually includes: a Cocoon Air-Core Hyperlite Pillow inflatable pillow (enjoy not endure I say), toothbrush and paste, dry socks, clean underwear, packet of tissues, thermal base layer trousers/long johns, change of top. Also kept in its own colour-coded dry bag for finding quickly (I’m such a geek). Includes: a warm and waterproof pair of gloves (Extremities), a thinner pair of fingerless gloves, a warm hat and a Buff or two. Key for adding a warm layer in the three-layer system (baselayer next to skin, midlayer for warmth, waterproof/windproof as outerlayer). You can buy a fancy softshell, but in the UK I find a bog standard microfleece works well. I go through this a lot, but my go to one is my The North Face one (now replaced with the Endeavour Thermoball Jacket). Look for something not only waterproof but also breathable (otherwise you get damp inside). In spring/summer a lightweight one is fine, but in winter you’ll need something more robust. Go for a helmet compatible hood if you plan on doing climbing/winter skills/cycling and definitely one with a wired or stiffened peak (can be reshaped after being stuffed in your backpack). Adjustable cuffs, hood and hemlines help with fit and draught excluders on the zips will keep water out (all zips leak – don’t put mobile phones in the external pockets!). I’m currently rocking my Arc’Teryx Beta. This is the layer that you put on over everything when you stop to eat or admire the view (as any heat from ascending or walking fast you’ll loose quickly in the cold). It’s also a great jacket to pop on when wild camping as it keeps you toasty warm. I go with my Berghaus Ilan Jacket as it has hydrophobic down inside which still lofts when wet so will still keep you warm (synthetic is good for wet/damp weather as it also works when wet but does tent to offer less warmth for weight). I’ve forgotten mine in the past and always regretted it. Go for ones with full-length zips so that you can pull them on without having to take your boots off first. I have used Berghaus’ Gore-Tex Paclite Shell for years, but as they’re discontinued I’m now trying out and loving Mountain Hardwear’s Stretch Ozonic Pant. You can’t beat a Sigg (well you can physically, and mine has the dents to prove it – though each one tells so many memories). Use it to collect water and as a makeshift hotwater bottle on cold nights (it takes boiling water – but wrap it in your fleece or sock before putting in your sleeping bag as it will be scalding!). I once knew a girl who took a salad wild camping and had the most miserable night of her life. This is not the time or place to diet. Go for a calorie packed dehydrated meal for great weight for nutrition value. Again, never skimp on snacks. Cereal bars, chocolate, nuts, dried fruit – all work here. Collect together as many as you think you need – then take a few more. A friend of mine who volunteers for Mountain Rescue and is a Mountain Instructor had to have 3 knee ops by the age of 35 because he never used poles. Not only do they help distribute weight when wearing your heavier pack, but also take 30% of impact of your knees when descending. And on flat ground, if you use them right, you should actually find yourself walking faster… bonus. I’m currently loving my Leki Vario Carbons. For midges you can’t beat Avon’s Skin-So-Soft, also try Smidge too. Easy to forget but you will burn in summer and winter without it on sunny days. Needed for winter walking in the mountains when there’s snow on the ground – but even more key is the knowledge of how to use them – so get trained up. I’ve done my winter skills in Glenmore Lodge – highly recommended. I usually only take if bothying in case something needs repairing.